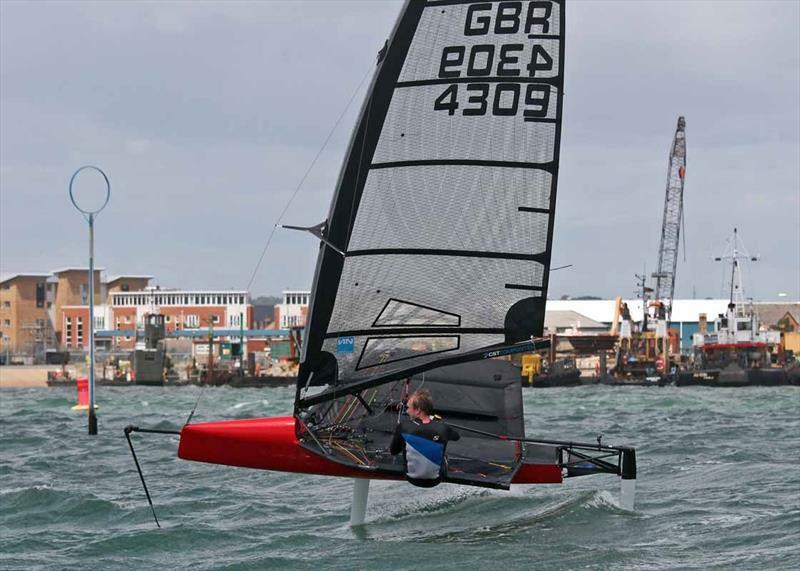 With a few of the fleets key players missing claiming the dinghy show as an excuse to avoid the cold weather there was a chance for others names to fight for some of the top spots at the first round of the Nobel Marine International Moth Grand Prix series at Queen Mary Sailing Club. Although Rashley Racing was still odds on favourite for the number one spot other questioned remained, would Ben Paton complete a full series to pick up second? The bookies said no. Although the winds were light as the fleet launched the breeze built gently throughout the day so there was no problem from lack of wind. As predicted Chris Rashley and Paton sped off into the lead taking an easy one two with Jim McMillan taking third. Race two started in a similar vein to race one but half way through Paton decided to have a rest scoring his first DNF of the weekend leaving McMillan to take second. Race three saw a tight group of four stretch out from the fleet over the first lap with Alex Adams hanging on to the normal three leaders although a number of unforced errors in the shifty breeze on the second beat saw him drop back. However, Queen Mary still had one last trick to play on the fleet as they came round to start the final lap. A 30 knot squall came through to shake things up a bit. McMillan spent some time swimming at the windward letting Adams past who went on finish just meters behind Paton who was struggling to get the boat downwind and over the finish line in the fresh conditions. The Sunday was a lot lighter with plenty of holes to catch people out. At the beginning of race one Rashley looked to be continuing his run of bullets only to get caught out on the wrong side of the run allowing Paton to storm through for a dominant win! In Race five McMillan sneaked away from the fleet, who were left low riding at the windward, into a seemingly insurmountable lead of over a leg. The racing was tight amongst the next 4 boats with Jonathan Heathcoat joining the party. Unfortunately for McMillan he went left up the second beat and had to sit and watch as a group of boats foiled past up the right hand side of the beat. On the next run the 5 lead boats all came into the leeward mark as one. And after a bit of shouting Paton decided that since he had already proven in race one beyond reasonable doubt who the best sailor is he packed up and went home. I suspect at their next training camp Paton and Rashley may have a bit of a debate about the implications of rule 18 while gybing in the zone at the leeward mark. On the final run Adams found a puff and jumped into the lead only for a rudder ventilation on the final gyb into the finish to drop him to third. In the final race the wind was much lighter with plenty of lowriding. The lead changed countless times as people found a puff of wind and foiled into the lead only to be left standing as another boat did the same. In the end it was Heathcote who took the final win of the weekend leaving Rashley the well-deserved overall winner. 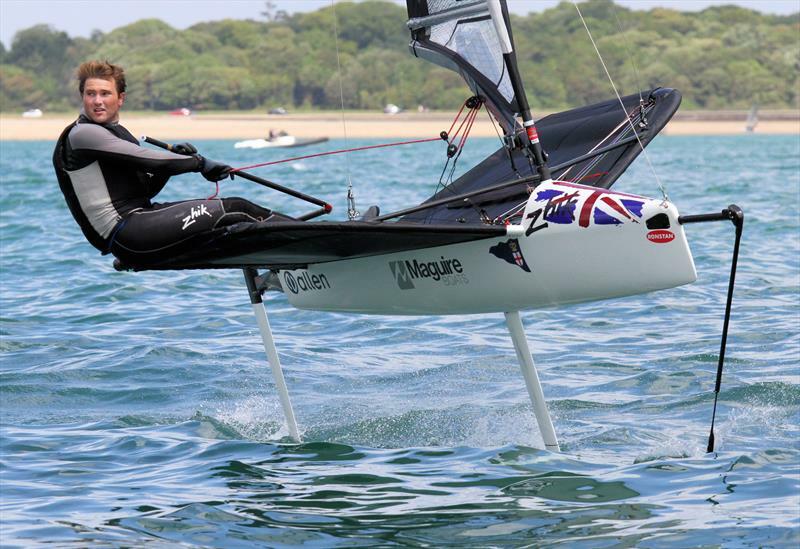 Our thanks go to Queen Mary Sailing Club for putting on a great event and the event and class sponsors, Noble Marine.